Today I'm playing along with The Paper Players. I used a stamp from Simon Says Stamp called "Happy Christmas"
and patterned papers from my stash. What a wonderful take on the sketch, Doni! I love the stripes paired with the ivy paper...it's so pretty. Your sentiment is perfect for the holiday season. Thank you for sharing with The Paper Players! 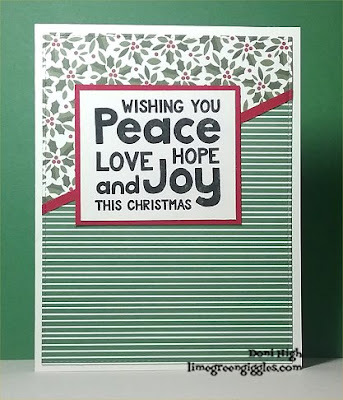 I love your festive red and green combo Doni - the stripes paired wit the holly give your card a fresh, modern feel. A great sentiment too. Thanks for joining us over at The Paper Players this week!